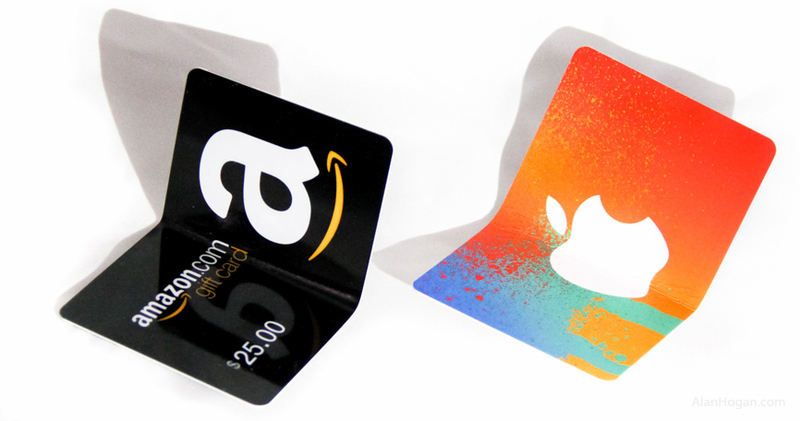 Gift Cards and Corporate Values: Amazon.com vs Apple Inc.
Last night I redeemed two physical gift cards. In fact, they were exactly the ones pictured below. The Amazon card really casts a longer shadow. Keep reading. First I redeemed an iTunes gift card on my iPhone. The only hard part of the process was finding the “Redeem” button, because I had to scroll down to the bottom of the iTunes app’s main tab. After that, I simply had to point the iPhone’s camera at the back of the gift card. The app read the redemption code with OCR and confirmed my new iTunes balance of $10. Immediately afterward, I opened the Amazon.com app on the same iPhone and tapped “Gift Cards” in the menu. 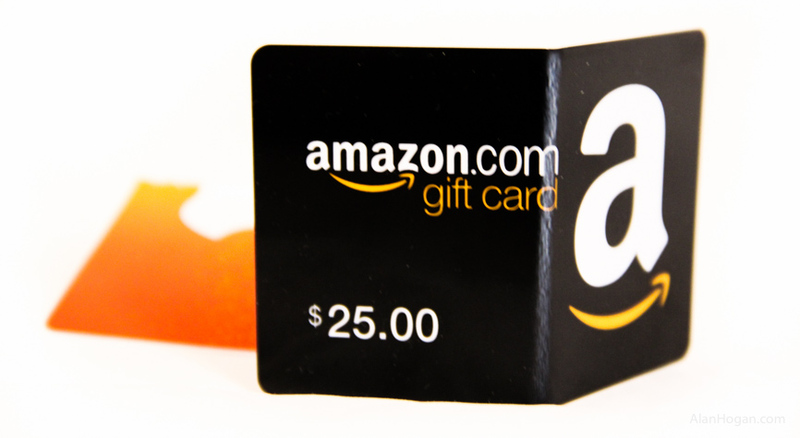 The resulting screen is focused on selling gift cards, but Amazon helpfully added a “redeem” link that is easy to spot after scrolling down. Then I had to type in the redemption code (using the on-screen keyboard). There was no option to scan the card, but my new balance of $25 was confirmed as soon as I had finished. At this point, both cards’ value had been transferred to my online accounts, and the physical objects became trash. To mark the occasion, I bent the Amazon card in half, and then proceeded to do the same to the iTunes card — which surprised me by giving easily. Hey! This isn’t plastic, I realized. And I experienced the trademark of good design: Well, of course, I thought. Of course. 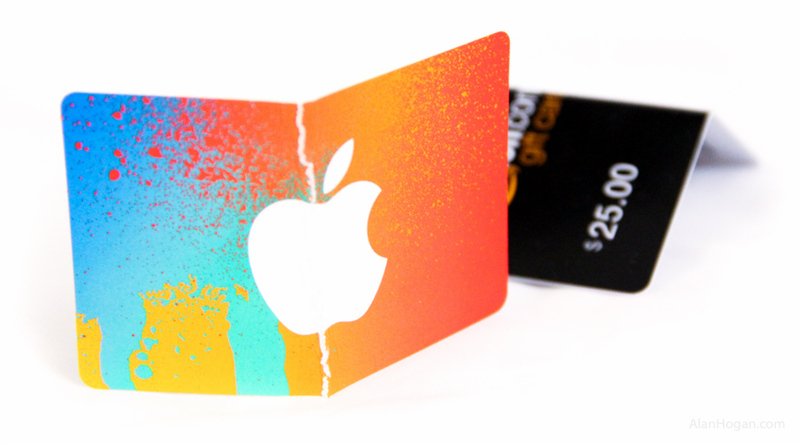 Apple knew this card would be used exactly once, and then thrown out. It makes sense to make it out of biodegradable and renewable paper product, not plastic. Apple is notable among American corporations in that they spend money in ways they refuse to justify with ROI, but because it’s the “right thing to do,” and CEOs Jobs and Cook have been forceful on this point. Apple runs all US operations with 100% renewable energy and uses fewer toxic chemicals in their products than most anybody. (Hell, Al Gore sits on the board.) They have the best customer service in the computer & cell phone industries. Their labor record isn’t spotless, but the company has taken an active stand for civil rights on behalf of their employees and does more to improve conditions in manufacturing facilities than any competitors. These cards were perfect reflections of the values held by Amazon.com and Apple Inc. The incredible power of corporate values is that it guides decision-making at all levels. The employees responsible for gift cards at these companies didn’t need to be told exactly how to run their operations; they could just apply the corporate values on autopilot.